The Deal With Iran is Terrible. Here’s Why Congress Should Support it Anyway. Killing the deal now won’t bring a better one. 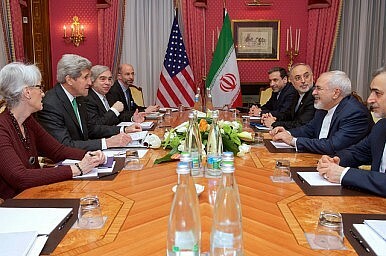 The recently concluded nuclear agreement with Iran is a terrible bargain for the United States. It gives Iran sanctions relief, which means Iran will have a lot more money to spend sowing chaos in the Middle East. The accord reached in Vienna is actually weaker than the preliminary agreement struck in Lausanne earlier this year, which failed to address Iran’s ballistic missile program at all. The deal reached in Vienna actually lifts the existing embargo on selling ballistic missiles. Even worse, the agreement essentially puts the world’s leading powers on record that Iran has the right to enrich uranium to weapons grade after just fifteen years. Taken together, all this means that in all likelihood, in a little over a decade Iran will have the ability not only to build a nuclear bomb but to deliver it against Israel. Because of the obvious shortcomings of the agreement, many in Congress are demanding that the deal be rejected outright. As bad as the Iran deal is, this would be a mistake. The smarter choice would be to go along with the deal for now but vigorously enforce the oversight provisions under the Corker-Menendez legislation. That way, if Iran cheats on the agreement the sanctions can be put back in place and it will be Iran, not the U.S., that is seen as having wrecked the accord. The fundamental problem with the notion that Congress ought to reject the Iran deal is U.S. sanctions alone are not enough to force Iran to give ground on its nuclear ambitions. In order to stop Iran from pursuing a nuclear weapon, sustained international sanctions are required. Congress can only vote to keep American sanctions in place. International sanctions are already coming off. The UN Security Council has voted to approve the Iran deal, meaning that UN sanctions are already coming off. The EU has also begun the process of terminating its sanctions on Iran. An international sanctions coalition is required for sanctions to have enough of an effect on Iran’s economy to force a change in their behavior. American sanctions alone won’t do the job. Congressional rejection of the Iran deal would play right into the hands of Iran’s hard liners. The deal struck in Vienna is predicated on all parties, including the U.S., lifting sanctions in exchange for Iran’s curtailing its enrichment activity. If the U.S. doesn’t actually lift sanctions it will be the first party to breach the agreement. It is not clear why Iran would see any reason to carry out its obligations under the deal if the U.S. refused to hold up its own end of the bargain. Under this scenario, UN and EU sanctions will have been lifted, Iran will have already received the economic relief it needs and it won’t be made to comply with any of its obligations to stop enriching uranium to weapons grade. It’s a bad deal to lift international sanctions in exchange for the meager concessions Iran gave in return. It would be much worse to lift international sanctions in exchange for nothing which is exactly what will happen if Congress balks. Make no mistake about it: If Congress rejects the Iran deal the result will not be new negotiations and a better deal. The result will be the end of European sanctions and a nearly unrestrained Iranian nuclear program. It would be much cleverer for skeptics to allow the deal to go forward but to use the provisions of the Corker-Menendez legislation to enforce the deal aggressively. Corker-Menendez requires periodic reporting to Congress by the president on Iranian compliance with the agreement. If Congress decides Iran is not in compliance they can vote to re-impose sanctions. The procedures for that vote will be the same as the procedures for the vote Congress intends to hold after the August recess, meaning that it won’t be any harder procedurally to re-impose sanctions on Iran later than it is right now. If this deal fails it should fail because Iran breached its obligation to stop illegally enriching uranium and got caught. It should not be allowed to fail because Congress wouldn’t give the agreement a chance to work. It matters very much who is blamed for the collapse of these accords and if Congress kills the deal blame will fall on the U.S. Congress will have achieved the extraordinary feat of making the Iranian mullahs looks like the reasonable party. Even to its allies the U.S. would appear erratic and untrustworthy – the exact characteristics critics of the deal ascribe to Iran. Instead, the Congress should go along with the deal, at least for now. It should exercise its oversight powers and, if Iran does cheat, it should move to re-impose U.S. sanctions and the next president could move to use the snap-back provisions to put all the UN sanctions back in place. The one success the U.S. negotiating team had in Vienna was to develop an effective method for preventing Russia or China from stopping the reintroduction of sanctions if Iran violates the terms agreed to in Vienna. Between Corker-Menendez and the snap-back sanctions the tools exist to put sanctions back on in the event of an Iranian breach. If Congress kills the deal now, though, it is hard to see how the U.S. can ever put any kind of serious enforcement program in place once Iran decides to restart its enrichment activities. Congressional Iran hawks will have inadvertently produced the outcome they fear most – an Iran headed towards a nuclear weapon with no plausible means for stopping it.